I knew the end of the world was closer than we let ourselves believe when i saw the above image. 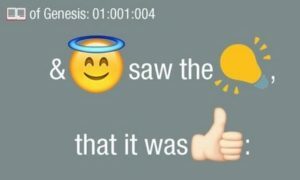 An Emoji Bible? Really? Is that what is next? At least the guy is making waves and raking in his money, but is that the next thing the church needs? How exactly is this going to draw people closer to God? I know the argument going on in your head; it’s the 21the century, everything has gone technological even people have evolve (we have robots that can pass as human this days). so why shouldn’t the church evolve, why shouldn’t the bible evolve? The word of God was written thousands of years ago and we have tried to manipulate and bend those words to our taste all in the name of evolving, all in the name of living in the 21st century, the question we failed to ask is the the power of God evolve in our lives in our world as we evolved the words? It’s a new era, we no longer live in the age of Moses or Elijah; so the scriptures shouldn’t be inscribed on stones any more. There should be a better means of spreading the gospel, well technically there should also be better and more spectacular manifestations of the power of God than during the time of Moses. Unfortunately that’s not the case. If you give an average christian the hard copy of the bible and ask them to turn to the book of Zachariah or Habakkuk or Joel or the book of Jude, they won’t be able to because they don’t know where it is in the bible, they have been used to just typing the first letter of the book and it comes up or just scrolling through a list and clicking on the book. The church has lost it’s purpose, we have taking our eyes of the prize and crafted ourselves a new goal. I’ve once attended a service of a relatively big church and throughout the service, there was no sermon or message, no preaching nor teaching. We never had course to open the scriptures but to a lay man the service was great. The praise and worship session was awesome, there were testimonies, drama presentation choir ministration. We jumped, danced, shouted and rejoiced in the holy ghost but at the end of the day there was nothing tangible i could say i gained from the service no meaningful addition to my life. The drama ministration was spirit filled, it broke down many people and a lot of people rededicated there lives to Christ (that’s obviously a good thing and am not condemning the drama presentation) but besides that there was nothing i could pin point to that i learnt anew or from the scriptures. You enter some churches and their choir will be ministering as if they are at a rock concert, the leader will be jumping up and down the stage like he is a relative to Terry G, there will be spot lights, multi-colored rotating lights going round the auditorium will now start looking like a disco all. Haba! am not condemning or criticizing it o!, it’s not as if these things are bad but some of our churches over do it and that’s were the problem comes from. I don’t have this Emoji Bible yet but i will still get it (for fashion) it’s not as if i will be using it when I’m having my quiet time… wait it will even be occupying my limited storage space sef. 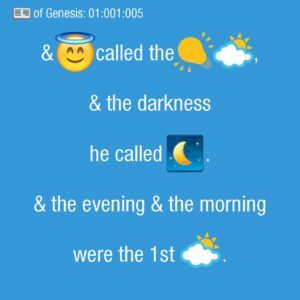 But in case you’re interested in the bible you could download it at bibleemoji.com or from itunes.com. Tweet at me @shalombrain on Twitter and let me know what you think of the bible.